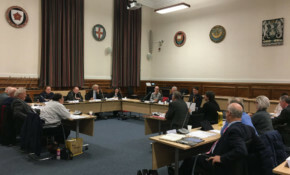 Follow the discussion at this month's Isle of Wight council scrutiny committee as members review the Council’s Contact Centre as well as complaints process and items going before Cabinet. Find out what your councillor has to say about the issues being debated at first Isle of Wight full council meeting of 2019. Follow our live reporting here. Find out what your councillor has to say about the issues being debated at the November Isle of Wight full council meeting. OnTheWight will be reporting live from the Isle of Wight council’s Cabinet meeting, where, among other things, members will make their decision on controversial plans to scrap the Local Area Coordinators. We report live from the chamber so you don’t have to make the journey to Newport to find out how councillors scrutinise the Fire Service Review and other items. Find out what your councillor has to say about the issues being debated at the September Isle of Wight full council meeting. We report live from the chamber so you don’t have to make the journey to Newport. Find out what your councillor has to say about the issues being debated at the July Isle of Wight full council meeting. We report live from the chamber so you don't have to make the journey to Newport. Follow the action from the Isle of Wight council Annual Meeting from the comfort of your sofa. We drive to Newport and back so you don't have to - and we report live from the council chamber. The Fire Brigades Union (FBU) had said that if the Cabinet approved the review of the Fire Service it will “put public safety at risk” and the Scrutiny Committee voted to scrap the plans. OnTheWight will be reporting live from the April Extraordinary Scrutiny Committee where members will be considering the proposed fire service review and the an update on the Cowes Floating Bridge.